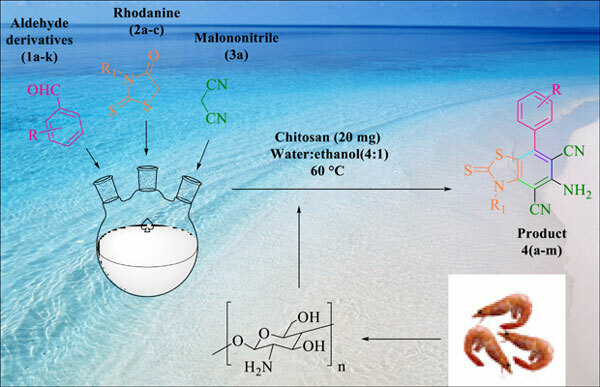 Background: A green, recyclable and reusable chitosan catalyst has been utilized for the synthesis of 5-amino-2,3-dihydrobenzo[d]thiazole-4,6-dicarbonitrile and its derivatives. Methods and Results: Three-component reaction protocol incorporates the reaction of aldehydes, malononitrile and rhodanine derivatives. This is examined as an efficient route for the synthesis of dicarbonitriles utilizing a green, biodegradable, environmentally benign, and easily available chitosan catalyst. In the reported protocol, catalyst can be recycled and not any substantial dropping in its catalytic activity during the recycling steps was obtained. Conclusion: A green and environmentally benign, one pot three-component protocol has been illustrated for the synthesis of 5-amino-2,3-dihydrobenzo[d]thiazole-4,6-dicarbonitrile derivatives. Adequately yield products were gained via the natural catalytic approach with the recyclability of the catalyst. The use of chitosan represents this procedure as an attractive substitute for the synthesis of biaryls complex by multicomponent reaction condition. 5-amino-2, 3-dihydrobenzo[d]thiazole-4, 6-dicarbonitrile, biaryl, chitosan, green & biodegradable, natural biopolymer, organocatalyst.